On Sunday we worked on putting up some Red Brand Sheep and Goat fencing to contain the dogs into a couple acre area of the property. It comes in 330 ft. rolls and we already had wooden posts in place to tack it to. We also got some welcome signs for the front gate. Wednesday night we went into Pensacola to do the World of Beer run. Then we had a few Thanksgiving Eve drinks. Yesterday was Thanksgiving so I whipped up a turkey, stuffing, mashed potatoes, butternut squash, green beans, rolls and of course, gravy. Matt installed a gate to separate the fields and the pups watched from the shade of the Jeep. It was a gorgeous day so we spent most of the day outside playing Kan Jam and had our dranksgiving dinner outside as well! I am so thankful that I am finally able to live the life I feel I was meant to live. 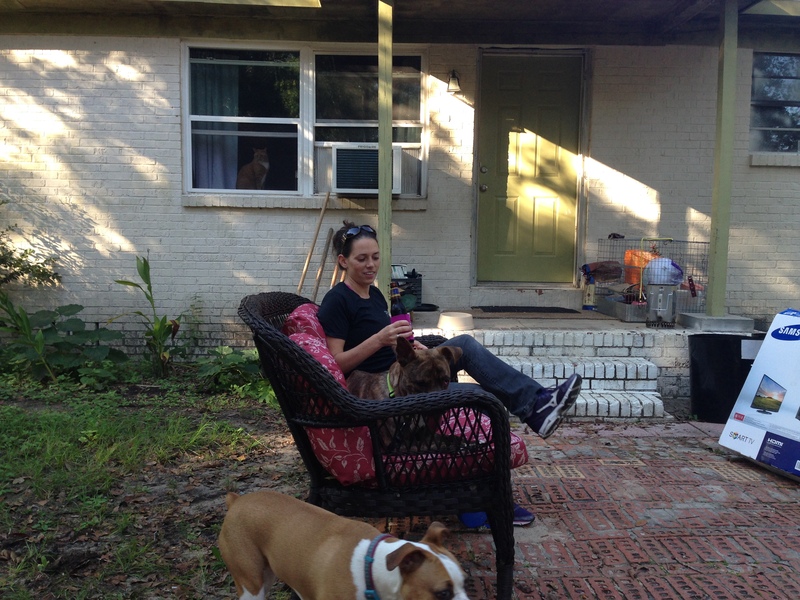 I do miss the family on holidays, but I was thrilled to eat my first Thanksgiving dinner outside. And cuddle with my newest lap dog. Projects on the farm are in full force! Last weekend we decided to fence off the front entrance to the house and use the first gated entrance as our only entrance to the property. We started with a gaping hole in the fencing. But after a few hours we were able to build two doors for a gate and close it off. This will help keep the mutts contained. All in a days work. During the week, Joe and I created a place for our compost with some half rotted fence posts and some chicken wire. We also decided it would be a good idea to plant an orchard. We went to the local nursery and purchased a fig tree, a peach tree and a kumquat tree and got them planted out in the back field. We also picked up a raspberry plant but are waiting to install more fencing before planting that. Stella and Jake helped. Sort of. 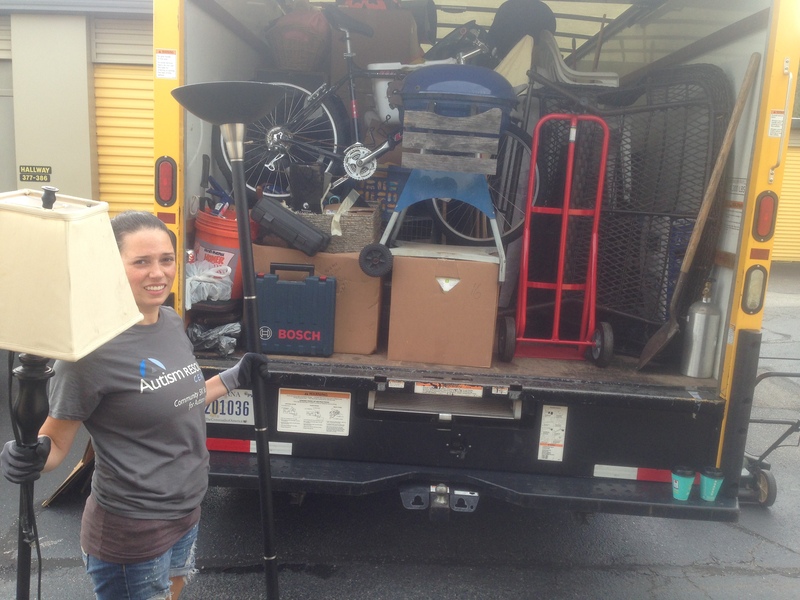 On Saturday we went back to our storage unit and finally collected the remainder of our belongings. Everything that we couldn’t find a place for in the house we were able to store in one of the offices in the barn. Then Joe and Matt had a celebratory shotgunning of a beer. Then we pretended that the puppies were horses and put them in one of the horse stalls in the barn. Stella escaped. Up this week is our first Thanksgiving on the farm! I should probably go get me a turkey. Well it’s been a while since I have been able to write a blog post, so I have lots of updates to share today! On Wednesday, the 4th, I closed on the house! 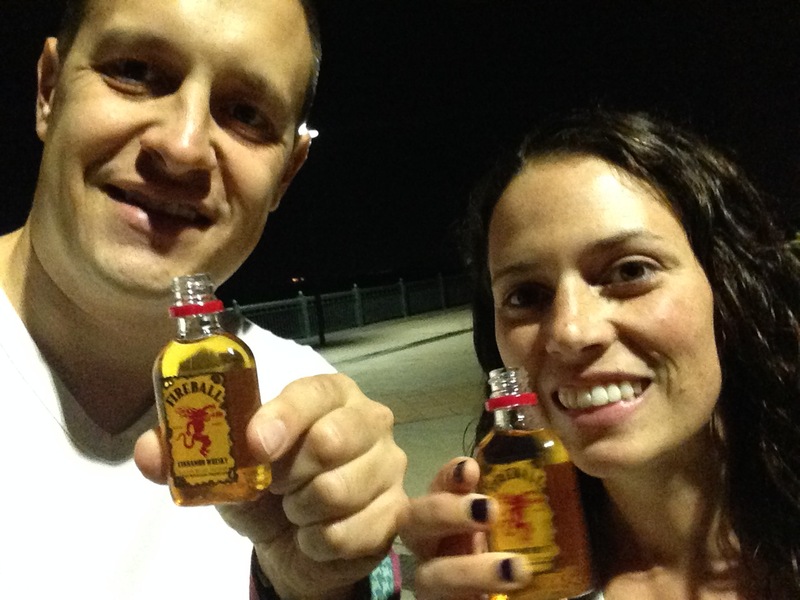 Matt and I went down to the pier to celebrate with some Fireball whiskey shots we got from the adult pinata at aunt Jill’s Halloween Party. On the following Saturday, we rented a Penske truck and moved our stuff in! Well, some of our stuff. We have a lot of stuff. 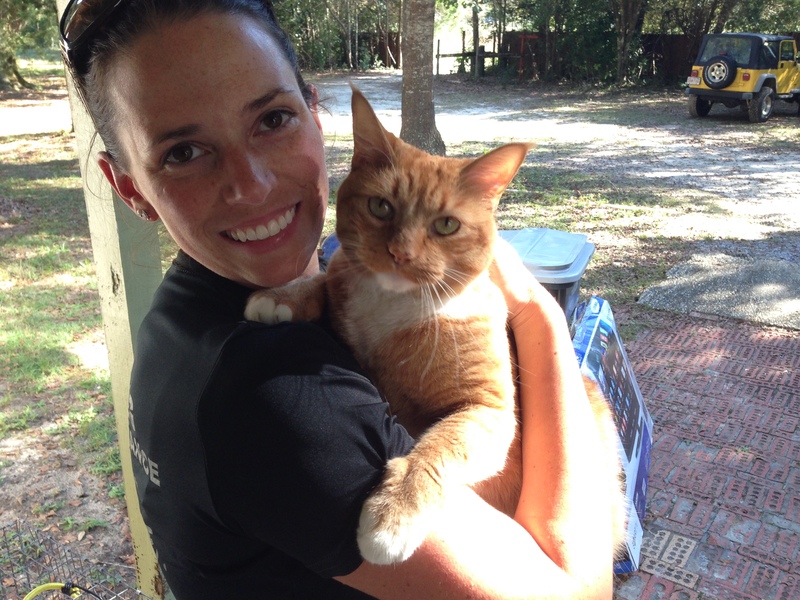 It was a long day, but we still had time to go to the Escambia County Animal Shelter and adopt a new friend for Stella! His name is Jake and he is the sweetest boy! 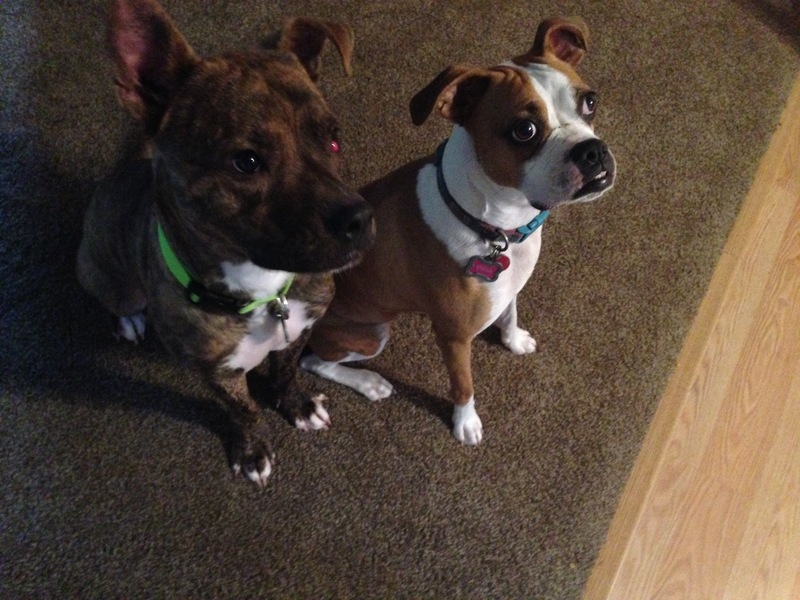 Stella has struggled with some jealousy issues, but they have become great friends. On Sunday it rained and we did a lot of unpacking. I continued unpacking on Monday and Tuesday while Matt was at work and then Wednesday came and Matt had the day off for Veteran’s Day. Also, Joey arrived on Wednesday! After an arduous day and a half drive, he arrived at the farm and he had a surprise for me! Now that Leo was here, it really felt like a home. We showed Joe around the property and got him moved in. 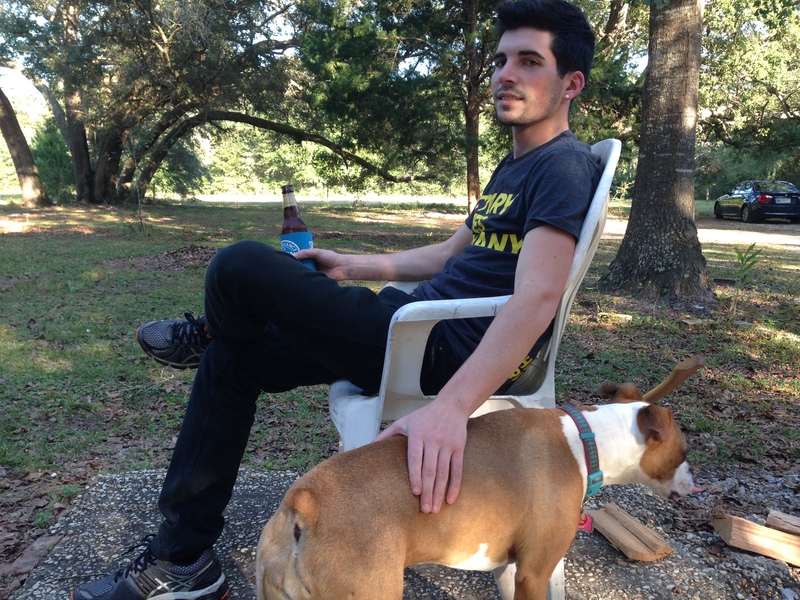 Then we relaxed with some beers and the farm pups. 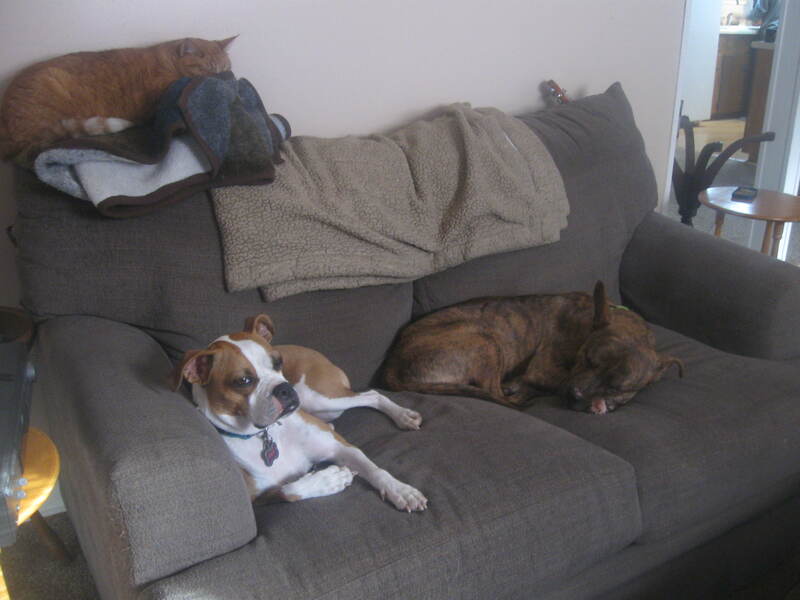 After a long week of unpacking and working on the farm, everyone is pretty exhausted. But, we have lots of exciting things planned for this weekend, so tune in next week for a weekend update and a recap of the farm projects thus far! Matt took a vacation day from work on Friday and we took a mini road trip down to Brooksville to visit with some family. It took us about 6 hours to get to Sarah’s house and introduced Stella to Barrow and Yana. Stella and Yana really hit it off and they had a fantastic time running around in the yard together and wore each other out over the weekend. 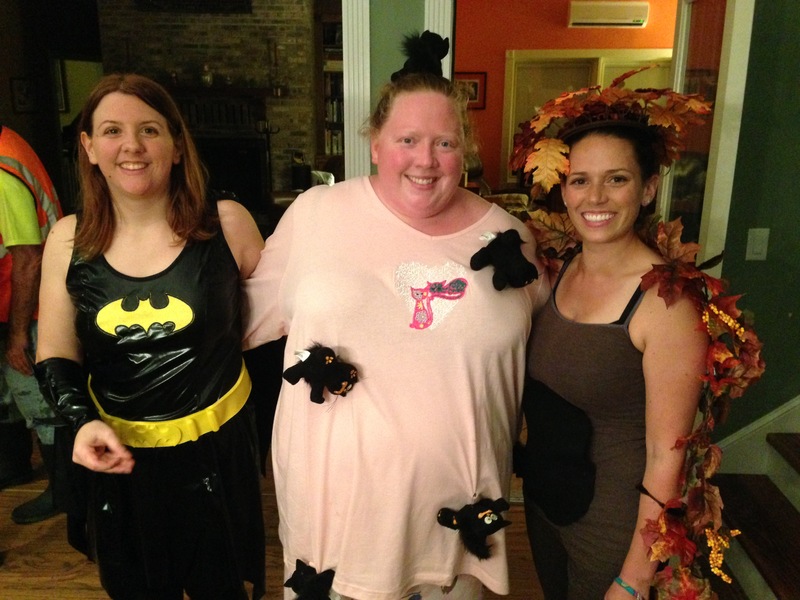 On Friday night we got dressed up and headed over to Aunt Jill’ house for a Halloween Party. There was a live band, an adult pinata and Matt and I won an award in the costume contest. Who knows who we are? 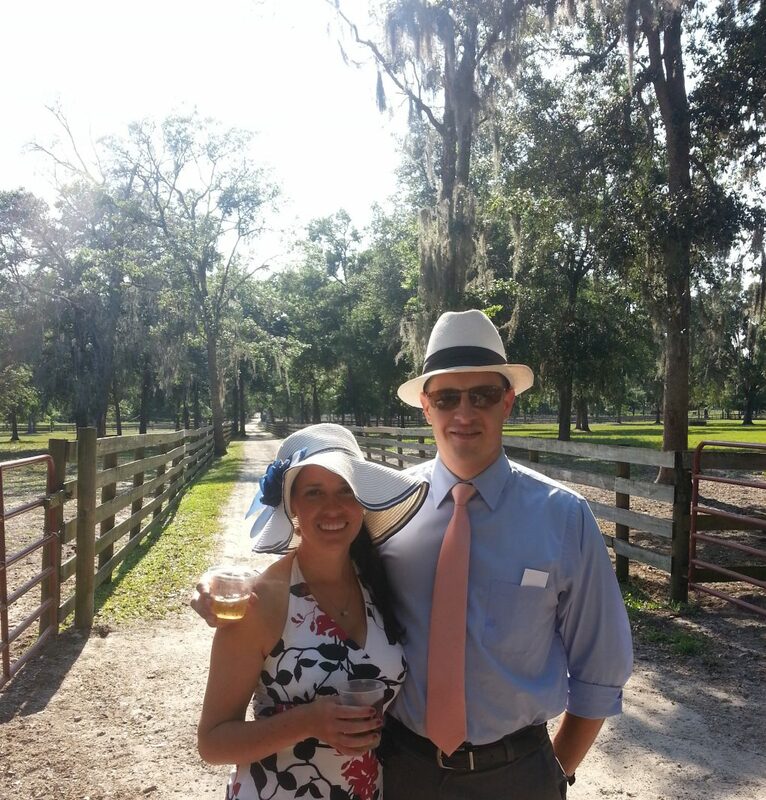 There was food, drinks, dancing and much merriment. The next day we enjoyed a day outside at Sarah’s and Stella learned about electricity when she walked into the electric fence….twice. 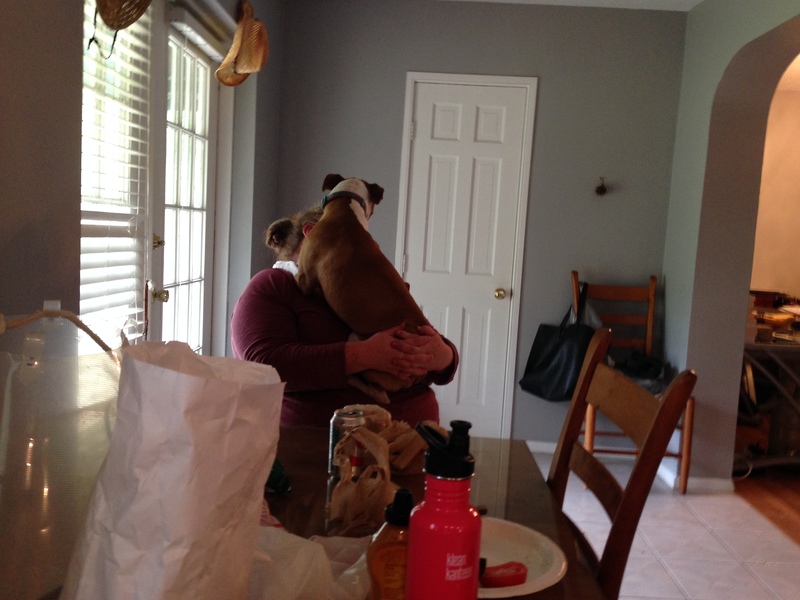 Then an exhausted Stella gave Sarah a hug goodbye and we went on our way. 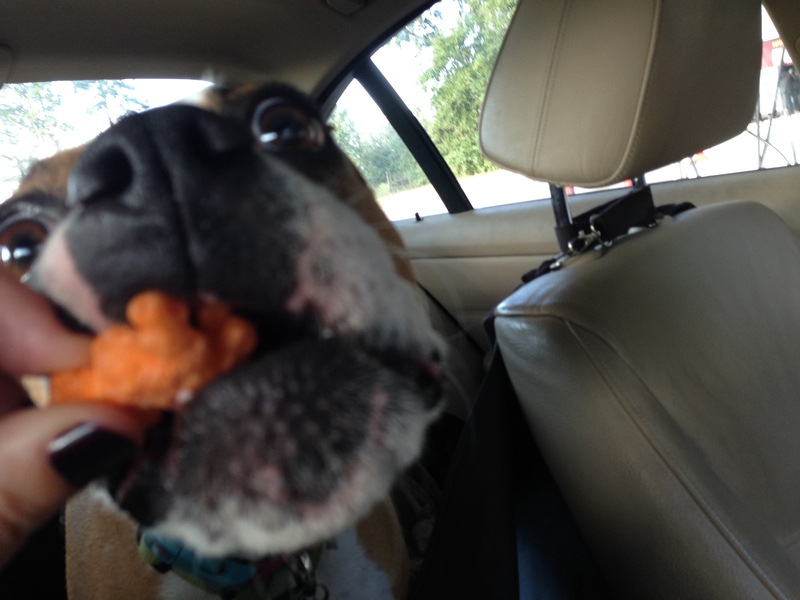 Luckily, Sarah packed Stella some treats for the ride back. 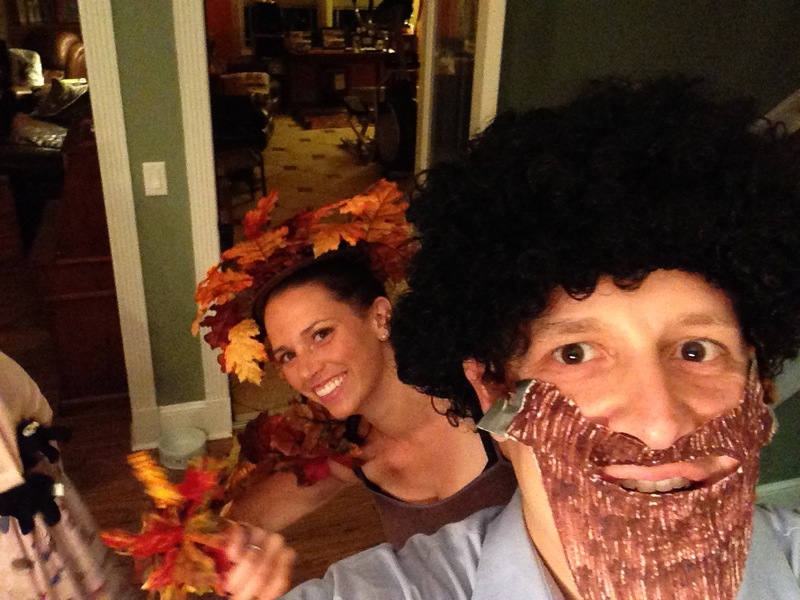 So has anyone been able to guess who Matt and I were for Halloween? Did the pictures bring back childhood memories of Saturday mornings listening to that soothing voice? 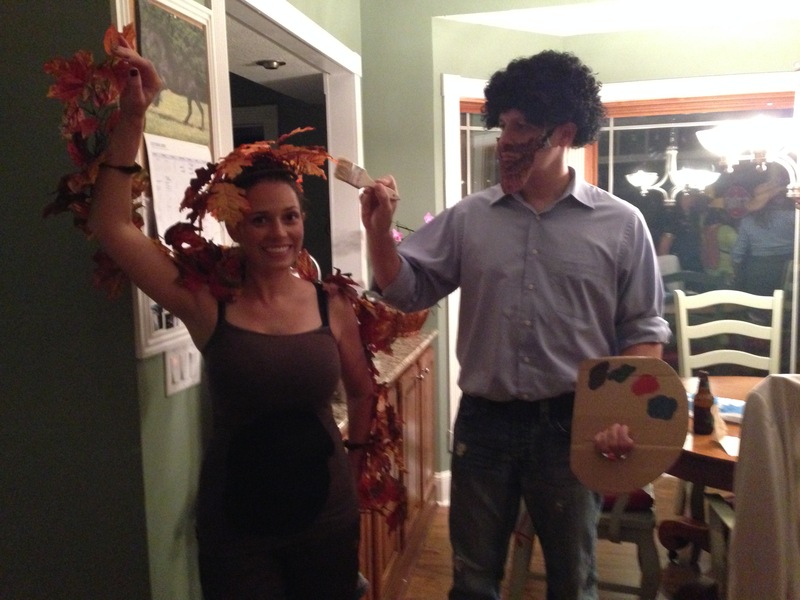 Why of course we were none other than Bob Ross and a Happy Little Tree! Thanks Sarah and Jill for hosting us this weekend! Housing update: Closing is set for Wednesday. Everyone cross your fingers that everything goes smoothly and that the next post will be from inside my castle walls!